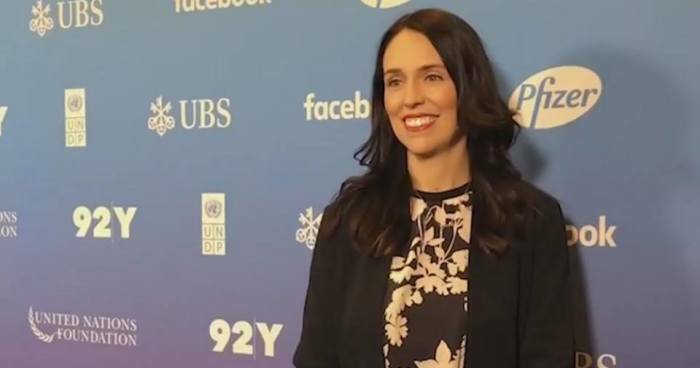 It's a year to the day since Jacinda Adern became Prime Minister of New Zealand. Today she addressed the 9th Annual Social Good Summit in New York City as the keynote speaker. Press Secretary Jule Jacobson sent through her speech. I bring with me the warmest of greetings from Aotearoa, New Zealand. Can I start by thanking UNICEF, not just for hosting this event, but for the work you do on a daily basis. New Zealand is a proud partner with UNICEF in the Pacific, and I don’t just know that from reports I have read, I know that because I have seen it in action. Recently I visited Fasi Primary school in Tonga, where UNICEF was working to provide tents and school supplies in the aftermath of a devastating cyclone. Together, our response was necessarily swift. To see children sitting in make shift learning with the devastation around them – classrooms without roofs with children’s pictures still hanging in tatters from the walls - was both heart wrenching but encouraging. Learning was still happening amongst the wreckage, and plans were already in place to rebuild again. This wasn’t the first time I had seen children in difficult and trying situations displaying such resilience. Some years ago I worked for an international youth organisation with membership from across the globe. Several of the members represented displaced people from the likes of Bhutan and Western Sahara. My visits to refugee camps for both peoples left a lasting impression on me – especially the children. Some had learned English and would throw out their hands while enthusiastically repeating “how do you do?” Others wanted to know where I was from so they could find it on their classrooms map. Perhaps that’s the reason, if you ask me why I am in politics, it’s children that will come to mind immediately. Like all of you here, I feel a huge duty of care to our most vulnerable, and genuinely believe our success as leaders should be judged on no lesser standard than the well-being of children. On the face of it, the wellbeing of children in New Zealand appears to be pretty good. We are incredibly lucky to come from a country where children can be children – we are free from war and the devastation that comes from long term political instability. We have a beautiful environment, universal healthcare, and a world class education system that encourages play. But we are not perfect. We are not free from violence, we are not free from natural disasters and all the stress and strain that can bring, and we are not free from poverty. Now I cannot change the fact that New Zealand is known as the shaky isles. I can’t change the extreme weather events we are increasingly experiencing – well at least not immediately, but let’s leave the climate change conversation for another forum. But what is within our power, and the power of governments globally, is just about everything else. That is why I have come into office with a single minded determination to improve the lives of children in New Zealand. Well first of all, it means fundamentally changing the way we govern. We have had rates of growth that international commentators have remarked upon and commended, but at the same time we also had some of the worst homelessness in the OECD. I don’t consider that success. That’s why we are working to change what success means, and what it looks like. We will also track our progress using a range of new and different tools. Statistics New Zealand are developing an ambitious project called Indicators Aotearoa New Zealand. It creates a comprehensive set of indicators across the dimensions of the current wellbeing of New Zealanders, and future wellbeing across economic, cultural, social and environmental measures. Taken together, these tools will help us deliver, and monitor the delivery of goals like the SDGs. We’ve set a few ambitious goals of our own too. Especially when it comes to children. I come from a country that has some pretty strong values, and a strong sense of our place in the world. We might only be 4.5 million people, but we were the first country in the world to give women the right to vote. We championed the notion of a welfare state and state built housing, and our legislation in the late 1980s around the care and protection of young people was considered ground breaking. All of this, I believe, is born out of a sense of fairness, equality and care. We hate injustice, don’t especially believe in notions of status, and think everyone deserves decent opportunities. And that starts with children. Every child should have the best start in life, regardless of ethnicity, gender, or the socio economic status of their parents. That’s why we have set as one of our 12 priorities as a government, making New Zealand the best place in the world to be a child. Not the best place to raise children, but to be a child. That’s not to ignore the importance of family, or parents. But to simply view our work through the lense of children. Interestingly, even from that angle, the well-being of the family unit as a whole comes through pretty strongly. In fact I was struck by the work of our children’s commissioner recently. We are working on a child well-being strategy in New Zealand, and as part of this work, his office went out to children and young people and asked them what their expectations were of us. I read some of their responses, and I can tell you that they were pretty frank and forthright. Two things in particular struck me about their comments, and the comments I have seen through similar exercises undertaken by UNICEF in New Zealand. The first is that children and young people think beyond their immediate day to day concerns or wishes when they’re asked what they need. They care about big things, like climate change and the well-being of children who have less than they do. But secondly, and importantly, children see their well-being as intrinsically linked to the well-being of those around them. They worry about their parents, and that they have enough food and can pay the bills. It was heart breaking for me to read the comments from children, who even at a young age were choosing not to ask their parents whether they could learn a musical instrument or join a sports team because they knew the cost would be too much. Or to hear from school principals that children were staying home from school on the days their parents couldn’t muster lunch for them to save them from the shame of coming to school with nothing to eat. Yes, child poverty is a relative measure. But in a developed and wealthy country like ours there is no excuse for deprivation, no reason that any child should go hungry – at least no reason that we should tolerate. But when children asked us to do something about these issues, they didn’t temper their feedback. They wanted us to be bold. And so that is what we are doing. Currently the New Zealand Parliament is considering a piece of law, that when passed will require us to set targets to reduce child poverty, and report on them alongside every budget we produce. We have already set our first set of targets, which aim to reduce our rate of poverty and hardship among children, by at least a half within the next ten years. Secondly, we have already implemented policies that I hope will improve the financial well-being of our low and middle income earners – and their children. We have lifted the minimum wage and made significant changes to our welfare and tax systems so that most low and middle income families will be, on average $75 a week better off. This alone has lifted thousands of children out of poverty. We’re extended paid parental leave from 18 weeks to 26 weeks providing time for children to bond with their parents. We’ve set a goal that everyone has a warm, dry affordable home and kicked off a major house building programme called Kiwibuild to help make this a reality, alongside minimum standards for rentals to ensure kids don’t get sick or die from respiratory illness in cold and damp houses. We’re reinvesting in public health and education, with a particular focus on the early years, including early childhood education and eliminating charges to see the doctor for all children under 14. But despite all of this, we know there is more to do. Much more to do. Today marks the day that one year ago we had an election in New Zealand. That election ultimately brought me and my government into office. I want to use this one year anniversary to recommit myself and the government I lead to making New Zealand the best place in the world to be a child. A place where every child has a warm dry home, where their local school is the best school possible, where there is food and a health system that is there when they need it. And perhaps most importantly, a place where they are loved, valued and heard. I want that for the children of New Zealand as much as for the children of Western Sahara and Bhutan. Thank you UNICEF for all you do to make that a reality.